Mr. Amjad Hussain Sial, Secretary General of South Asian Association for Regional Cooperation (SAARC), met with Mr. Takehiko Nakao, President, Asian Development Bank (ADB), on 19 March 2018 in Manila, Philippines, to discuss ways to increase cooperation between SAARC, ADB, and regional initiatives such as the South Asia Subregional Economic Cooperation (SASEC) Program. Check out the video clip above of Mr. Sial speaking on strengthening SAARC processes. A memorandum of understanding for cooperation between SAARC and ADB was signed in April 2004. President Nakao noted the importance of SAARC’s role in promoting regional cooperation in South Asia. Mr. Sial also met with ADB Vice-President Wencai Zhang to discuss future collaboration between ADB and SAARC. 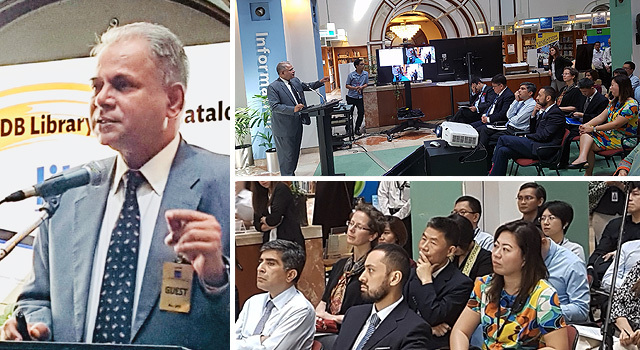 Speaking at a high-level seminar organized by ADB’s South Asia Department on 20 March 2018, Mr. Sial highlighted the need to strengthen linkages between SASEC and SAARC. He said SAARC and ADB leadership both recognize the need to have synergies and harmony and noted the prospects for better cooperaton. See a short photo slideshow of the seminar below.